The Springy Goddess: Never bet on the hardware. Never bet on the hardware. One of the perks of being the Goddess of Random Equipment Malfunctions is that I occasionally get to vent My wrath on a piece of equipment. 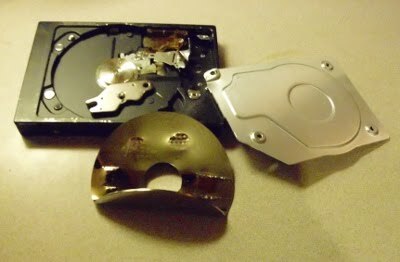 This is an old hard drive after I got through with it. The objective: Open up the drive; make the data unreadable; rescue the cute little magnet within, and to Niflheim with the rest of the apparatus. The hard drive had been assembled with small proprietary hex screws in a vain attempt to enforce the rule "No User Serviceable Parts Inside." Since I was more interested in destroying the drive than servicing it, this merely slowed Me down. After trying My jeweller's screwdrivers, a smallish Phillips screwdriver and the somewhat obscure #0 Robertson screwdriver, none of which quite fit, I headed to the basement of Astrejurhof. Clamping the intractable drive in the bench vise, I hauled out a power drill and drilled out the heads of the razzafracking screws. Prying out the platter with the data on it, I clamped it in the vise and pummeled it with a 23-ounce framing hammer until it was bent at a rather interesting angle and the 1's and 0's had been duly rearranged. A bit more drilling detached the mechanism that held the magnet in place, and then everything else went into the trash.